Habitat International Coalition was born out of, and—for two generations now—has faithfully upheld the Habitat Agenda as a cornerstone of its global platform. Over the last generation, HIC has cautioned about the erosion and abandonment of the core human rights commitments and recognized obligations enshrined in Habitat II. Accordingly, the current Habitat III processes and, in particular, its outcome documents now cause us deep concern. We have borne witness to the progressive amnesia about the Habitat Agenda and its integrated commitments through the lack of monitoring and reporting against them, despite annual report bearing disingenuous titles such as “Implementation of the outcome of the United Nations Conference on Human Settlements (Habitat II)” and “Coordinated implementation of the Habitat Agenda.” In the same 20 years, we have seen parts of the Habitat Agenda selectively spun off as campaigns or projects. However, even after belated formal commitment of UN-Habitat, human rights have been deliberately relegated to a side project, without operationalizing human rights consistent with the mandate of a UN Charter-based specialized organization. 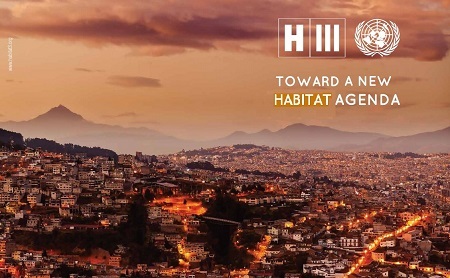 While participating in all relevant forums involving UN Habitat, HIC Members have twice voted to remain critically outside of the normatively hollow and unprincipled World Urban Campaign, as it further reflects and consolidates UN Habitat’s abandonment of the core principles and commitments of the Habitat Agenda. This pattern of stripping away the Habitat Agenda values is now manifest in the latest iteration of the revised Habitat III draft outcome document. The present draft has retained some unprecedentedly positive features. However, the overall trend is not headed in the right direction. The “radical paradigm shift” referred to in the previous draft—now unstated—already has happened, but not in a positive sense. We had hoped that the New Agenda would reflect more coherence with current global policy processes and standing commitments, not least the habitat approach and commitment to balanced rural and urban development within a framework of human rights and related international instruments. Nonetheless, we all, as contributors to this new global policy, can still put the New Agenda back on a principled track, while also addressing some of the shortcomings of the previous Agendas, with greater knowledge and experience over their 40 years, and with greater relevance to current and emerging challenges. We welcome the reference to the right to the city; however, would prefer to have its meaning and contents also appear in the form of commitments. As GPR2C has pointed out, R2C is independent of other human rights, but certainly does not replace the bundle of human rights applicable in human habitat. R2C rather complements the content and already binding obligations to human rights, which, alone, do not adequately address such contextual issues as spatial justice. Meanwhile, as R2C remains in the current text (presumably because it aligns with the shift to a narrower “urban” agenda), other specific human rights are now deliberately left out (e.g., water and other indispensable process rights). Only vague and inoperable references to human rights appear in a couple of instances as mere decoration. The expression “shared systematization of existing rights” is not meaningful, nor does it explicitly refer to human rights. We appreciate also the vision of cities and human settlements fulfilling their social function, including the social function of land, ensuring the full and progressive realization of the right to adequate housing. However, that preambular reference does not properly cite the “human” right, leaving it open to interpretation as a mere property right, and is not reflected in any operative section of the draft. We welcome the “recognition” of the [human] “right to adequate housing” in para. 39, and seek to develop this beyond mere recognition into operable commitments consistent with state obligations. Meanwhile, in the same paragraph, we find the singular references to preventing forced evictions and the needs of the homeless and persons in vulnerable situations. This language is far weaker than the three firm —although tragically unheeded—Habitat II commitments to “prevent and remedy” forced evictions, and the present text is out of alignment with the corresponding norms developed since Habitat II. We favor also the logical extension of rights to remedy and reparations to victims in the case of such “gross violations” of human rights. Also “combatting homelessness” must be restored as a Habitat III commitment to rectify root causes, as, like forced eviction, states did not sufficiently uphold their Habitat II commitments to resolve such scourges, and they remain highly relevant to the renewal of global policy today. HIC welcomes also the reference to the spectrum of “cities, town and villages” as an attempt to restore the territorial approach, if even contradicting the draft’s more narrowly and exclusively expressed “urban” title. However, it omits the prior Habitat Agenda commitments to balance and the explicit regional and cross-sectoral habitat approach to human settlements planning, emphasizing rural/urban linkages and treating villages and cities as points along a human settlements continuum in a common ecosystem. Nowhere do we find acknowledgment of anything like an international macro-economic order or financial system, conveniently forgetting recent lessons and dissolving previous Habitat Agenda commitments—however unheeded—to maintaining just macroeconomic policies consistent with the Habitat Agenda. Rather than address global wealth inequality and the broken financial superstructure, the revised draft only invites World Bank and regional development bank support for the New business-as-usual Agenda. The good-governance commitments of Habitat II have disappeared, and democracy appears only once in the current draft. The remaining language on local government is now even weaker than the previous draft. The present portrayal of subsidiarity and local governments as mere implementers of national policy promote a hierarchical, stratified concept of government, with central governments at the top, and local governments at the conceptual bottom. We favor keeping “democratic local governments as our closest partners” in implementing the New Agenda, but also with a clear recognition that we seek that partnership not merely with local “authorities,” but actual local “government” in the participatory democratic sense. We also join other partners in promoting the vision of governments operating within “spheres,” not stratified tiers, which aligns with the international law view of the state as a legal personality constituting territory, people and the whole of its constituent government parts with common-but-differentiated obligations. The economic dimension of human settlements dominates the perspective reflected in the current draft. Numerous ideological turns of phrase give the impression that the social, environmental, human rights and related governance dimensions are subordinated to a business model of urban development. While HIC recognized the role of the private sector in sustainable development generally, privately interested actors should not be the principle reference and driver of public policy, locally or globally. HIC Members have long advocated—and practiced—more people-driven processes, as adopted in the key recommendations of the UTC “Housing in the City We Want,” Barcelona, November 2015. That gathering called for “the renewal of standing Habitat Agenda commitments to combat homelessness and to state-supported social production of habitat (SSSPH), implementing public policies that guarantee appropriate access to land, adequate financing schemes and technical assistance.” This vision also perceives urban planning as a social good and element of the contemporary human right to adequate housing. We also support other inputs from civil society Partners that deserve inclusion in the New Agenda. This is the case with social solidarity economy, the social regulation of real estate markets, stronger commitments to gender equality and women`s rights, ensuring easy access and full participation for people with disabilities, and the call for effective measures to end the habitat destruction of conflict, war and occupation, among others. Restoring these elements to a New Habitat Agenda would go far to ensure us the habitat we need for the next generation.